We’ve been learning about God, the everlasting Creator, as we study His own account of how He created, and think about why He created in that way. God relates to us by His Word. With limited time in a sermon, we focused especially upon how this is because He relates to all of His creatures through THE Word, the eternal Son, our Lord Jesus. But we could well have made a study of how the Lord relates to us via the words on the pages of Scripture. The words through which He makes us alive, the words through which He brings us to faith, the words through which He ministers His continual fellowship to us, the words through which He fits us for glory, making us holy. Oh that we would learn to look for Him and interact with Him by serious study of these words and continual reflection upon them! Rather than groping blindly after God with disorganized longings of the heart, we can diligently and passionately employ the means that He Himself has described by which He relates to us. “You have magnified Your Word above all Your Name”—Psalm 138:2. Of all the ways that God makes Himself known to us—of all of the instances of “His Name”—God has given His Word the very first place. Is that reflected in the way that you approach each day? 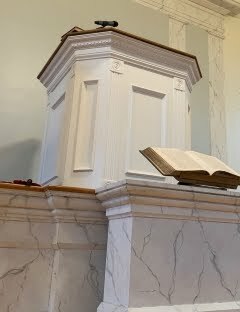 I pray often that it would be reflected in the way that we approach each week: that each Lord’s Day, we would worship Him by means of His Word (read, sung, prayed, preached, even seen/smelled/touched/tasted by means of the Supper), and that the entire rest of the week would flow out of this day with Him. Then, as the week begins to come to a close, we begin to anticipate eagerly another Lord’s Day in the Lord’s Word, making effort to prepare in a way that will enable us to attend to Him in His Word with as little distraction from it as possible. We’re coming to another Lord’s Day now. Won’t you prepare with me? One of the things that we haven’t talked about much as a congregation is the practice of Christian meditation. No—not the mental zoning out that is borrowed from various forms of manmade spirituality. But that meditation of which the Psalms often speak—dwelling upon and extended consideration of the Scriptures. While the practice is, of course, a great blessing to our own souls, it also has a value-added effect for fellowship and evangelism. What is continually on our minds will be readily on our lips. So, when we interact with one another, we will have material for making our fellowship an occasion of intentionally celebrating God’s goodness together or committing to God’s service together. But this works well for evangelism as well. One of the things that keeps us from talking to others about our Redeemer as the love and joy of all our life is that if we are honest, we are not thinking of Him enough. Another thing that keeps us from talking about Christ to others is that we are not sure what to say. Meditating upon Him by means of His Word addresses both of these deficiencies. Each week, pick one phrase or sentence in the sermon text that gets explained in a way that really comes home to you. Whether it’s a pleasant truth that has sweetened many days for you in the past, or something that you just learned/realized for the first time in the sermon, write that phrase down and carry it with you. Reflect upon it throughout the week. And if you happen to be in conversation with someone who doesn’t go to Hopewell, you can tell them where you heard that recently, and hand them an invitation card. These cards are available on the back table in the worship room. I suggest that you write down your own name and phone number and give them an invitation with a warm smile. You can also mention that the sermon you were talking about will be linked/streamable/downloadable right from Hopewell's homepage. Questions for Littles: What did God command to exist in v6? What would the firmament be between? What would it do to the waters? What new information does v7 give us? What does God call the firmament (v8)? What makes day two? In the Scripture for tomorrow’s sermon, we learn something rather odd. God spends an entire day creating just the firmament. Creating light and day and night—that makes sense to take a day. Sea and dry land. That seems pretty significant as well. Well, if you come to similar conclusions as mine, then we need to remember that when something strikes as odd in Scripture, it’s because of some fault in us—in this case, it would be because we don’t appreciate what this firmament is. Literally, it means a “beaten out thing”… the name implies intentionality, care, craftsmanship—and also hardness and smoothness (hence the English word FIRMament). Helpfully, the word doesn’t appear that often in the Hebrew Old Testament. In fact, its next significant use outside of this chapter is Psalm 19, Psalm 150, and then in Ezekiel and Daniel. Most of the rest of those occurrences have to do with the very throne of God—certainly not what we ordinarily mean by the atmosphere. So, we are on the lookout for something rather extraordinary. And that brings us to the waters. What are these waters? The waters below end up being great oceans of the earth. And the waters above? We don’t need to wonder about them. In a few short chapters, God is going to open windows in the heavens (Gen 7:11). This is more than just clouds starting to pour. It is the release of the wrath of God. So what was the firmament? The protection of God. Safety from His wrath to highlight the greatness of His patience—even with those who will perish. Now that’s no small thing, is it? How have you been responding to God’s patience and protection? Questions for Littles: Who arrived in v27? What did they marvel at? What did the woman do with her waterpot in v28? Where did she go? What did she say to the people (v29)? What did she say Jesus had told her? What did she ask about Him? How did the people respond (v30)? What were the disciples urging Jesus to do (v31)? What did Jesus say to them in v32? What did the disciples wonder in v33? What did Jesus say His food is in v34? What does Jesus tell them to lift their eyes and see (v35)? What does the one who reaps these fruits gather (v36)? Whom has Jesus sent to reap (v37-38)? Who believed in Him (v39)? Why? What did these Samaritans urge Him to do (v40)? How long did Jesus stay with them? How many else believed (v41)? Why? What did they say to the woman (v42)? 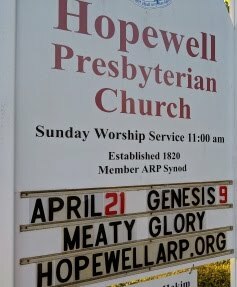 What did they now know about Jesus? In the Gospel reading this week, there’s eating and harvesting. But neither are what they seem. You see, it’s not just that the Lord Jesus uses illustrations from real life in order to make His teaching easier to understand. It’s much more than that. Jesus invented eating. He’s the Creator. Jesus invented harvesting. But there’s eating and then there’s eating. Jesus says that His human life isn’t sustained nearly as much by bread as it is by a desire to do the will of God. O that our lives would be sustained by a desire to do God’s will! Jesus then turns to them and their work. What should they be looking for as a reward for their work? Pay? Food? No—joy. Joy that belongs to everyone involved. Joy that is everlasting. And I hope that you and I shared in that joy too—especially as we read v42. They know and delight in Christ for their own experience of Him. Praise the Lord! And they know that He’s not just the “Christ” who will give them directions to worship, but is the Savior of the world. Hallelujah! What is the food that sustains you? How are you working for eternal joy? Questions for Littles: What possibility had Paul suggested in 9:27, if he wasn’t willing to deny himself for the sake of others? What privilege had their fathers had in 10:1? What privilege in v2? What privilege in v3? What privilege in v4? Who was the Rock? But what happened to them (v5)? What had they lived for (v7)? What had they done (v8)? Against whose patience had they sinned (v9)? What else had they done (v10)? Why had all these things happened (v6, 11)? Who should take heed lest he falls (v12)? Who makes an escape for us (v13)? In this week’s Epistle reading, we’re confronted with how terrible it is when someone who claims to be a believer does not live a life of self-denial. Chapters 8-9 made the point that living to please ourselves fails to love others. But now chapter 10 is making a much more serious point. If we live to indulge ourselves, it is a direct attack upon God. Even if we are church members, who have been baptized and take the supper (v1-4), living self-indulgently makes us idolaters. If when we sit down, it is to please ourselves with food and drink, and when we rise up, it is to please ourselves with play, then we are idolaters of the worst kind: idolizing ourselves. If we indulge our appetites (v8), put Christ to the test (v9), and complain when we cannot have whatever we want (v10), then we are failing to learn from Israel’s example. Would we love others well? Would we honor Christ with not just our lips but our hearts and lives also? Then we must deny ourselves! The “way out” of which v13 speaks is a way out of living in order to please ourselves. Amazingly, v13 is its own answer! How does the Lord lead us away from living to please ourselves? By this very passage, 1Cor 10:1-13… or, even better, all of chapters 8-10. How have you been denying yourself in order to live for the Lord? Questions for Littles: What were the people to be following (v1-3)? At what distance (v4)? Why that distance? What does Joshua tell the people to do to themselves (v5)? Why? What does Joshua tell the priests to do (v6)? What does Yahweh tell Joshua that He is going to do (v7)? Why? What does He tell Joshua to command the priests to do (v8)? What does Joshua tell the Israelites to come do in v9? What does Joshua say that v10 is showing? What does he tell them to set apart in v12? What does he tell them is going to happen in v13? What did the Jordan river usually do at this time (v15)? But what happens in vv16-17? In the passage for this week’s Old Testament reading, we find not just a miracle but the reason for it. The Lord tells Joshua that this miracle is about exalting Joshua in the eyes of Israel as He had done with Moses. The crossing of the Jordan, of course, reminds us of the crossing of the Red Sea. But notice that the servant of the Lord—even after being told that this is about increasing others’ esteem of him—does not give in to pride or narcissism. The Lord being with the His servants is really about the praise and glory of the Lord, not the servant. So Joshua announces that this miracle is a sign of God’s being with them and surely driving out from before them all of the peoples of the promised land. He reminds them that the ark belongs to Yahweh, Lord of all the earth. Joshua points out that it’s not himself that they are following, but Yahweh. This was the point in v4, wasn’t it? The Lord goes ahead of them. They don’t know the way, but He does. He is leading them. There are situations in life where we are led by the Lord’s servants, humanly speaking. And in those situations, we need to be both esteeming those servants highly, as the Lord intends for us to do, AND to be recognizing that ultimately it is the Lord who is leading us. And there may be situations in life where we are the servants who are doing the leading. Whether others rightly honor us or not, let us remember always to be following after Him and pointing them to Him! Whom has the Lord given you as a leader? Whom has He given you to lead? Questions for Littles: What were some Corinthians saying they were allowed to do (v12)? What were they saying the stomach is made for (v13)? But whom does Paul warn them will destroy it? For whom does the body exist? And what will God do with us that He has already done with the Lord Jesus (v14)? Of what are our bodies members (v15)? Of what must we not make them members (v15-16)? In what way are we one with the Lord Jesus (v17)? How should we respond to sexual immorality (v18)? Against what do we sin in sexual immorality? But what is this our body (v19)? How did God claim His right to us (v20)? What should we do with both our body and our spirit? But that’s not how someone who actually has forgiveness thinks. Rather, the one whose heart has been opened to the Lord and forgiven by the Lord wants to live in the way that glorifies the Lord and keeps him free from sin. But the apostle reminds us that we are not in fact the way that God made us. Sin and death have entered the world, and the fact that our bodies will soon lie in the grave is a reminder that our impulses are full of sin now. But the Corinthians were even using such excuses to tell themselves that it was ok to visit prostitutes. They were taking the temple of the Holy Spirit, the blood-bought possession of the Lord Jesus Christ—themselves—and joining it to a prostitute! It is a sad fact that, as Christians, we think so much about how we can best enjoy ourselves rather than how we can best glorify God. But living for ourselves is theft. Our whole selves—body and soul—have been bought with the blood of Jesus Christ. We must live in the way that glorifies Him! What must you stop that you’ve been doing? What must you do instead? Questions for Littles: How did God make the light (v3)? What did God see in v4? What did He see about it? How did God respond to the light being good? What did God do to the light in v5? What did God call the darkness? What two things came after the naming of the day and night? What did all of that constitute? From the Scripture for this week’s sermon, we learn many things about our God. First, He reveals Himself as One who relates to His creation verbally. God uses words to create. He invented words. We speak because He speaks. But this means much more for us than it does for the light. Because He also calls the Second Person of the Trinity “the Word.” Yes, we learn from the New Testament that God created everything through Christ. So, we do have that in common with the light. But light wasn’t created in God’s image like you were. And light hasn’t sinned against God like you have. And light doesn’t deserve Hell like you do. So the Word didn’t become light—He did not materialize and energize as photons and visible, electromagnetic radiation. No, the Word became flesh because you are flesh. The fact of the matter is that whether you want to or not, you will relate to God through Jesus Christ. It is appointed for man to die once and then after that the judgment (Heb 9:27). And the judgment throne before which we will sit belongs to Christ (2Cor 5:9-11). Kings and nations plot in vain trying to exert their will on the world, but God has determined that He will relate to all things through His Son (Psalm 2). He is the anointed who will shatter His enemies with an iron rod. How are you relating to Jesus Christ? Are you trusting in Him? Worshiping Him? Obeying Him? Serving Him? Ignoring Him? Resisting Him?